✔️ Six essential oils are derived using the latest steam and cold pressing techniques. All ingredients are pure, undiluted, and unaltered. 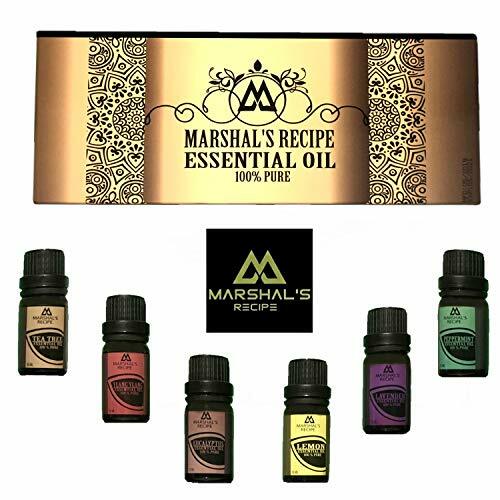 Only ingredients that meet Marshal\'s Recipe\'s Essential Oils 100% natural standards are selected. This means PURE Essential Oils without thinners, fillers, or any other additions. Pet friendly. ✔️ Therapeutic aromas ideal for use in room diffusers, vaporizers, air purifiers, or humidifiers, alternative to candles or incense. The calming oils can freshen up your space with soothing and calming scents, remove bad odours, and create a serene and tranquil atmosphere. ✔️ Good manufacturing process: our team of scientists, herbalists, and nutritionists have formulated our organic extracts to the highest standards of manufacturing practices. Our rigorous laboratory testing makes sure there\'s consistent potency and purity in every bottle. ✔️ Stylish gold box. Makes an ideal gift or treat for yourself. Full GMCP and GCMS tested oils from animal friendly and luxury sources around the world.